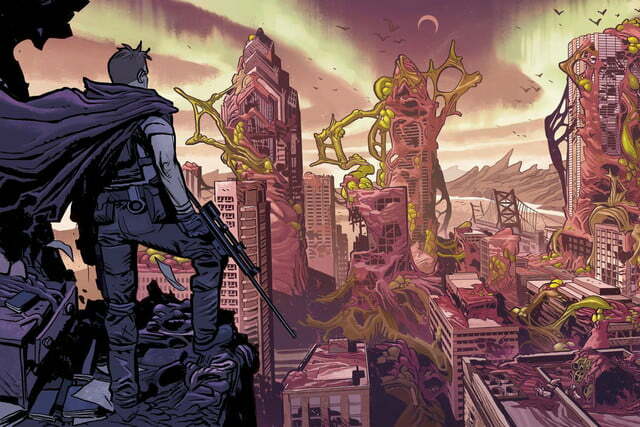 Robert Kirkman, creator of The Walking Dead comics, as well as the Outcast and Thief of Thieves comic books, has crafted a brand new adventure called Oblivion Song. 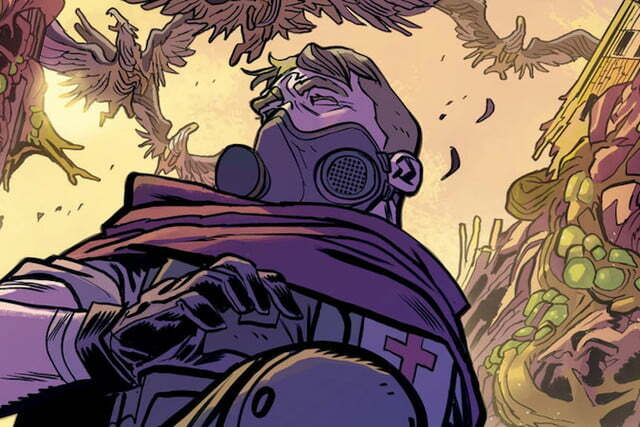 His latest comic focuses on a very different post apocalyptic story line where zombies have been replaced by predatory aliens and the hero, Nathan Cole, is a scientist who wears a cool cape. The story involves a dimensional rift that occurred a decade prior to the storyline, killing 20,000 people. The cosmic event swapped out a 30 square mile piece of downtown Philadelphia with an alien world, trapping humans in an alien world, and unfriendly aliens on earth. Cole has the unique ability to travel between these two dimensions at will, which means he contends with both alien foes and survivalist humans – neither of which are fun to deal with. 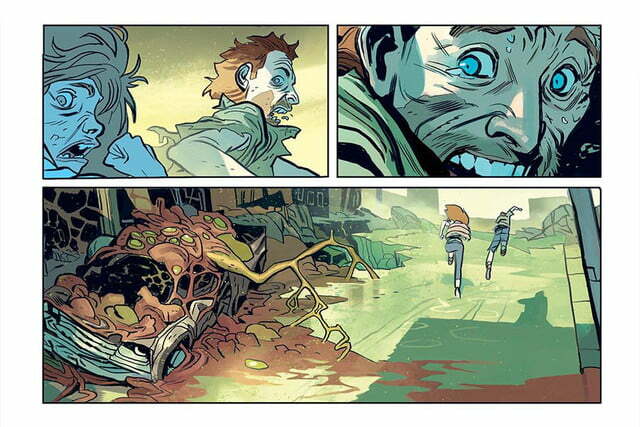 His latest comic focuses on a very different post apocalyptic story. Kirkman has been even busier than usual, of late. AMC brings Season 8 of The Walking Dead to the small screen on Oct. 22, while companion show Fear the Walking Dead continues to explore a storyline within the same universe. He’s also creator and star of a new six-part docu-series on AMC, Robert Kirkman’s Secret History of Comics, which premieres Nov. 12. Season 2 of Kirkman’s third adapted series, Outcast, is set to premiere later this year on Cinemax, while his Thief of Thieves comic is also in development at AMC as a new show. Invincible, another Kirkman comic, is being adapted for the big screen by Seth Rogen at Universal Pictures, and his company, Skybound Entertainment, just signed a first-look deal to develop television projects for Amazon Studios. In this exclusive interview, Kirkman talks about his inspiration for his newest comic book world, offers his take on why the comic book industry needs to change, and explains how the world’s most popular television show continues to evolve. Digital Trends: What was the inspiration for Oblivion? Robert Kirkman: Around ten years ago I read an article about how [legendary comic artist] Jack Kirby had never done a run on Batman, and how it would have been cool if he had brought his zany ideas and wackiness to a Batman book. It started making me think what would Jack Kirby’s Batman have been like? What kind of Gotham City would he have created? And what kind of tools would Jack Kirby have given him? If you think about it, there would be crazy weapons that Jack Kirby would have given him in the ‘70s that he would be using now like the Batman canon. So I started thinking about this cool superhero idea with some crazy technology and gothic locations. And over the course of a decade it changed and morphed every year until it was completely unrecognizable from that. So I’d like to be able to say it wasn’t because of an article about Batman, but it really was. And then another dimension popped into it about the complacency that we have as a society; how we can just ignore things no matter how bad they are. If you think about a big chunk of Philadelphia disappearing one day, and you fast forward ten years to where it’s like a thing in a museum that people talk about sometimes, but it’s not really that big a part of our lives; how weird is that? There’s just a lot going on in the story. And there’s a lot of inspiration from different places, and it kind of morphs into this madness. Do you see TV or film potential for Oblivion Song given the success of The Walking Dead and Outcast? I’m not just slumming it as a comic in the hopes that it will be made into a television show or movie. The potential is always there. Just because of everything that’s gone on with me with Walking Dead and everything, people are always interested in what new things I have going on. So it’s something that’s always in the back of my mind. When you write something for a comic book medium the pages don’t move, it’s all static images and there’s no sound. So there’s certain limitations. But I’ll be writing a scene and be like, “Oh, if this ever gets made into a movie or a television show we can actually do this with this scene.” So that’s something that I think about. But I love the comic book medium, so I’m not like just slumming it as a comic in the hopes that it will be made as a television show or movie. I don’t really care if it ever gets made into a movie or a TV show. The comic is the thing I love. And the fact that that exists is enough for me, but there’s a very good chance that it will happen. We’ll see. With The Walking Dead you deal with a lot of themes like hope and hopeless situations. 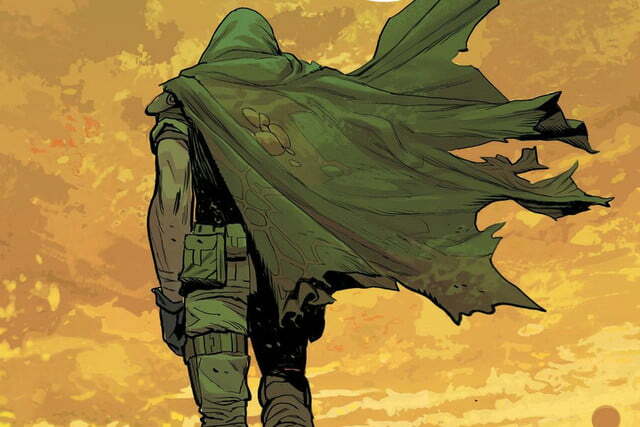 What kind of themes will readers expect in Oblivion Song? I like to say this is an apocalypse adjacent story. There’s very much apocalyptic themes that are present in here with the dimension of Oblivion that people have been living in for ten years. It’s somewhat similar to The Walking Dead in that they’ve had to survive without resources and discover a new way of life. But we’re very much coming into their space after they’ve already established that, so it’s much different in that they’ve already put the processes together and we’re not watching that struggle over time. As far as themes go, it’s not as dire as The Walking Dead is. It’s a very uplifting story to a certain extent because we’re focusing on one guy who is unwilling to give up on these people, who is continue to champion their cause despite the fact that the population at large has abandoned them to a certain extent. That is somewhat more hopeful than something like The Walking Dead. 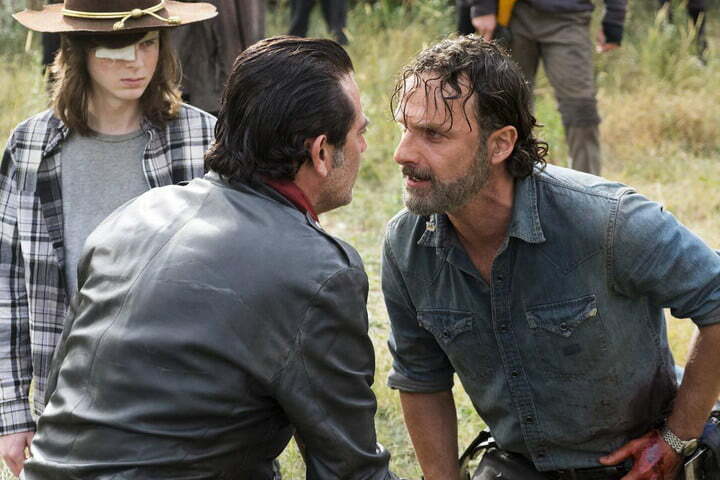 What are the challenges of upping the ante in The Walking Dead TV series each season? The comic book series is a real big help for us in that respect because as we’re upping the ante on the television show, we know the next four or five different levels that we can go to with the comic book series. So we have a road map, to a certain extent, mapping out the jumps and the things that we can do to keep people interested. Anytime you set out to tell a story over the course of many, many years, you have to have things built in that are going to escalate things so that the audience can remain invested. That’s something that’s been very much a part of the process of doing the comic book series and that’s helping the longevity of the show. How have you seen new technologies like virtual reality and augmented reality open up new opportunities for The Walking Dead franchise across gaming and storytelling in general? We’re doing a lot of stuff behind-the-scenes with VR and AR. It’s public that we’ve partnered with Skydance to work on a VR game for The Walking Dead and there’s just tremendous opportunity there because The Walking Dead is successful because it is so personal to people. The core of the story being about how someone survives in the apocalypse, how they deal with the loss of family members and how personal things are for the characters — and VR being a medium that puts you at the center of the story — lends itself very well. So we’re going to be able to explore a lot of themes in The Walking Dead because of that, and break some new ground and do some cool different things with VR because of that. You have a new docu-series on AMC, Robert Kirkman’s Secret History of Comics. What are your thoughts on the current state of the comic book industry, given the wealth of mature content? The industry has over-corrected to prove it’s not a medium for children. Comic books are a medium just like anything else. You can do material that’s explicitly for children. You can do material that’s explicitly for all ages, and you can do things that are more mature. It’s just a storytelling medium more than anything else, so it’s up to the creator to treat the medium with respect and really dig into the character and the nuances of things and tell the stories that they want to tell. I don’t think there’s any special trick to making a comic book appeal to an adult reader. If anything, the industry as it is right now has over-corrected since the ‘80s to try and prove that it’s not a medium for children. Now we find ourselves in a place where the majority of the readership is adult, and we’re striving to get back to being able to sell comics to kids, which is something that’s very important for the medium. So we’re at an interesting place with comics. Do you see there being another swing in comics, TV, and film aimed at younger audiences? If you look at the sales charts, the majority of what’s successful in comics does appeal to a mature audience. And for the future of every medium you need to be appealing to a younger generation so that you can continue to funnel in new readers that you know love experiencing that medium and want to continue experiencing it for years to come. I’m not going to preach doom and gloom or anything like that, but it is something that we’ll need to address moving forward.